House Speaker Nancy Pelosi meets with reporters for her weekly news conference at the Capitol on Thursday. The spotlight again focused on comments from Rep. Ilhan Omar, D-Minn., that senior Democrats, Jewish groups and many Republicans say were based on anti-Semitic tropes. Leaders have struggled to find an appropriate way to respond without offending any one branch of their party — all while trying to quell fears that the party is losing control of its policy message. It's a dynamic that House Speaker Nancy Pelosi, D-Calif., couldn't ignore as she opened the question-and-answer portion of her weekly press conference on Thursday. "We're busy with our legislative work," Pelosi said with a laugh, "despite what we might read in the press." But for a second day in a row, the questions started with Omar and veered into other public ways that Democrats have split in recent weeks. The latest furor surrounded comments Omar made a "progressive town hall" at Busboys and Poets, a Washington, D.C., restaurant and bookstore that often holds political events. Omar repeated her criticism of outside influences on politics in Washington with a veiled reference to lobbying from Israel. "I want to talk about the political influence in this country that says it is OK to push for allegiance to a foreign country," Omar said at the event. The comments set of a flurry of anger. Democratic leaders struggled to decide on an appropriate response. Republicans pressed Pelosi to remove Omar from her slot on the House Foreign Affairs Committee. They also pushed leaders to name Omar in an official rebuke on the House floor. The swift decision by leaders to move on another resolution drew frustration from Omar's progressive colleagues and members of the Congressional Black Caucus, who ultimately persuaded leaders to broaden their condemnation to all forms of hate. The debate over how to respond took days and slowed Democrats' initial plans to focus solely on the bill they dubbed their signature issue this Congress — combating political corruption. But the problems did not stop there. 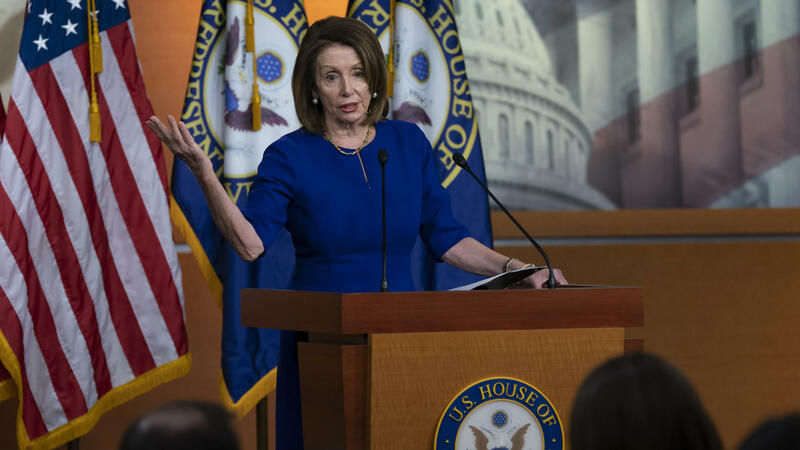 The controversy came as leaders continue to struggle over typically mundane procedural measures that Republicans are using to exploit Democrats' divisions. The dynamic is getting frustrating for a lot of Democrats. It is particularly vexing for freshmen like Rep. Abigail Spanberger, D-Va., a moderate who beat a Republican incumbent in 2018 and is already fighting for re-election. "We put forth a comprehensive package," Spanberger said about the campaign finance bill. "And people are talking about what's on Twitter, and I think that's a problem." Spanberger says the legislation on the floor this week is meant to reduce corporate influence on elections, expand public disclosures for campaign spending and make it easier to vote. But that's not where the public focus has been. Democrats in difficult districts rely on major legislative milestones, like the one they expected this week, to show voters that they followed through on campaign promises. The moderates' frustration is further amplified because many members of the progressive wing of the party are particularly adept at self-promotion using both traditional and social media. They have used their online prowess to rally outside groups and draw attention to liberal policies, like "Medicare-for-all." That leaves moderates in a position of responding to constant questions about whether progressives define their party. "No matter how many Facebook posts we push out, if the story on the front cover of every paper and in the opening five minutes of every show is: 'Is the Democratic Party becoming XYZ?' — that is a higher hill I have to climb," Spanberger said. The fights this week have given Republicans the opportunity to claim the spotlight. In the House, GOP leaders are doing so through procedural votes on a variety of issues — a tactic that allowed them to tack on a surprise immigration amendment to one of Democrats' prized gun bills. In the Senate, Majority Leader Mitch McConnell, R-Ky., is planning a vote on the controversial Green New Deal — a sweeping proposal to address climate change championed by progressives — to expose further Democratic Party divisions there. It's a dynamic that scares moderates who want to stick to more conventional policies, like infrastructure spending and lowering the cost of prescription drugs. Progressives like freshman Rep. Veronica Escobar, D-Texas, says the party can't rely on just those basic issues, even if that's difficult for some members. "You know it's a challenging time because the country is changing," Escobar said. "The party is changing, and the caucus is so representative of that." But the focus on progressive policies may be scaring some voters. Rep. Elissa Slotkin, D-Mich., says she's asked constantly whether all Democrats are turning into socialists and says it's frustrating to have to explain to more moderate voters that their interests haven't been abandoned by Democrats. "The extreme focus on a small portion of our caucus doesn't do any justice to the people of the Midwest, the people I represent," Slotkin said. "They have no less right to be represented than the far left." Moderate leader Rep. Josh Gottheimer, D-N.J., says it is clear that Democrats need get away from big partisan debates if they don't want to lose their majority. "We won the Congress through the middle," he said. "Don't worry about national politics. You don't work for the national party. You work for the people of your district." Rep. Pramila Jayapal, D-Wash., a progressive leader, doesn't disagree. She says that the debate over the resolution this week was just noise and that Democrats can recover if they stick together. "We are now the majority," Jayapal said. "Republicans have an intent to try and divide us whenever they can." Democrats hope they can get back to their message next week when they move on to working on advancing protections for victims of domestic violence.